At this time of year, as the days grow perceptibly shorter and the nights are beginning to cool, we enjoy sitting outdoors in the evening, sipping a glass of iced tea (or something stiffer) as the sun goes down, and reviewing some of the season’s highlights. One of the great joys of the 2017 garden season was a bumper crop of Blueberries. For weeks this summer, we feasted on handfuls of our own fresh-picked fruit, harvesting enough from our array of bushes to make pies and cobblers, and to top our cereal. Who or what gets the credit for the above-average yields? 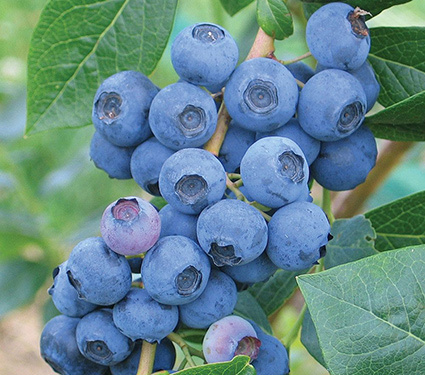 Blueberry bushes thrive in acid soil that is moisture-retentive yet well-drained. Mother Nature did her part by providing plenty of rain, a welcome relief from two previous seasons of drought, which afflicted our region and many other parts of the country. We did our part by boosting the acid level of the soil. 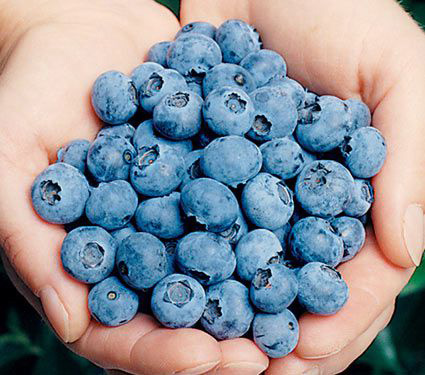 We compost our coffee grounds at the feet of our Blueberry bushes. A dose of high acid fertilizer administered twice a year, once in spring and again in early fall, also doesn’t hurt. Another factor in this season’s bonanza may have been this year’s temperatures, which were cool in early spring and relatively moderate in summer. Our Nursery Manager Barb Pierson points out that Blueberry flowers stay open longer when temperatures are mild. The longer they remain open, the more time pollinators have to make their rounds. In extreme heat, the flowers wilt, and pollination is thwarted. 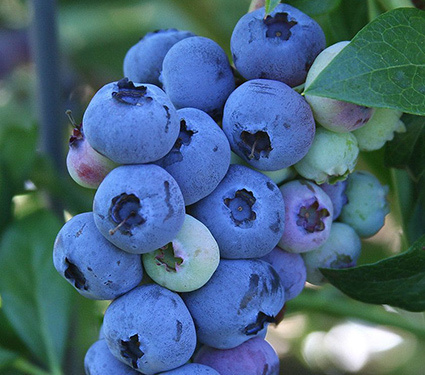 The season’s bumper Blueberry crop notwithstanding, these shrubs are too often overlooked for their ornamental value, something that becomes especially apparent at this time of year when the green foliage changes to shades of burgundy orange. They make a beautiful sight in the autumn light. It’s often said that native plants have what might be called a hometown advantage – growing better and requiring less support than plants that hail from faraway places. The plants in our new native garden at the farm certainly support the theory. While it must be taken into account that gardeners in our region had a generally fine year thanks to ample rain and milder-than-usual summer temperatures, it’s hard to argue with the stellar performance we’re seeing among the natives. The garden was designed by our head gardener, Cheryl Whalen, and planted out this spring. For inclusion, Cheryl chose a mix of species plants (“species” may be regarded as the original form of any native) and some improved hybrids (plants that have been bred to improve or enhance particular characteristics of the species). In the case of some varieties, Cheryl chose to plant both the species and an improved version or two, which affords us and our visitors the benefit of comparing their differences. The starter plants and bareroot specimens were planted in the garden in May. By July and August, the majority had taken off and filled in beautifully. Our enthusiasm for natives has led us to add more to our offerings over the last few seasons. Plant some in your garden and see if you don’t experience similar results. You’ll find an array of plants native to the Northeast here on our website. 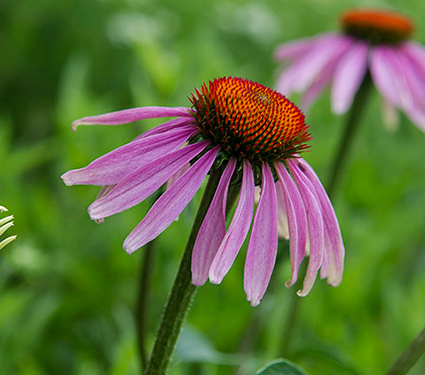 To find plants native to other areas, visit the Aububon Native Plants Data Base. Enter your zip code and a detailed list of plants will appear. The exquisite colors and sweet fragrance of Sweet Peas have made them a longtime favorite of floral designers. But because these plants adhere to a somewhat tricky timetable and require a bit of special care as they grow, they are rarely (if ever) found in garden centers or nurseries. Sweet Peas are started from seeds in late winter, and this can be a defeating proposition for anyone in a cool climate who lacks a heated greenhouse or indoor seed-starting capabilities. Sweet Peas are vining plants, and they tend to tangle as they grow, making them difficult to display on the crowded shelves in most stores. 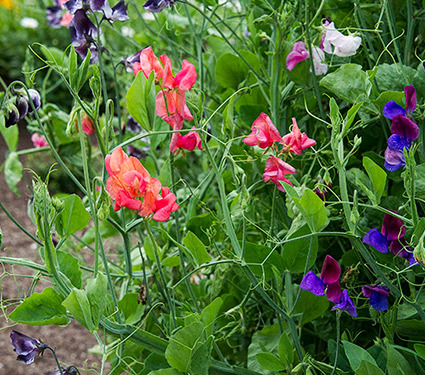 Because we love these annuals, and because the demand for them has grown in recent years, we undertook a trial this summer to see if we could ship Sweet Pea plants (not seeds) to our customers. We began by ordering Sweet Pea seeds in a range of pleasing colors. (This is easy work given the range of captivating colors and bicolors available.) We propagated the seeds in our greenhouses, and in early May, just prior to what turned out to be the season’s last frost, we transplanted some of the seedlings into our gardens at the farm. (Sweet Peas can take a bit of cold, and they came through the frost just fine. What they can’t tolerate is high heat.) Other Sweet Pea seedlings were shipped to our homes to ensure that our packaging held the plants securely and that the plants themselves would come through their few days in dark boxes in the back of unheated trucks. The happy ending to this story is that all of the Sweet Peas we trialed exceeded our expectations. Our gardens were filled with these lovely blooms, many of them sweetly scented, for weeks in June and July, which is roughly when the plants subside. As of this writing, our horticulture staff is selecting the varieties of Sweet Pea plants we’ll be offering to you in next spring’s Garden Book. 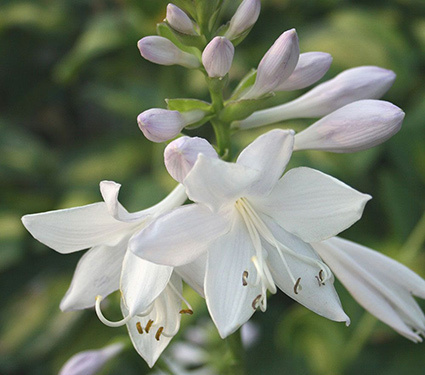 Our publications team is putting together the information you’ll need to grow these plants, which require the support of a trellis, fence, tuteur or bamboo stake, along with techniques for encouraging the maximum number of blooms and the long, straight stems that are prized for cutting. 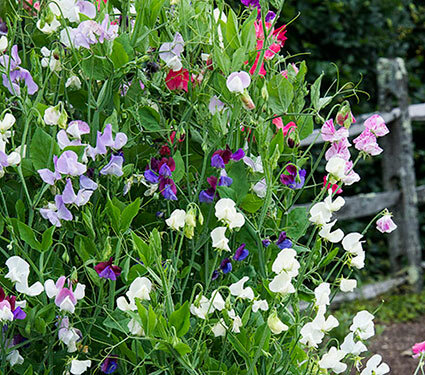 For a preview of some of these techniques and to learn more about Sweet Peas, visit the superb blog post on the topic by our friend Matt Mattus, the author behind Growing With Plants. You’ll find it here. 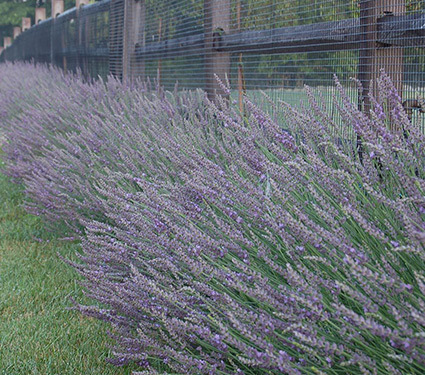 Several seasons ago, we planted a low hedge of Lavender Phenomenal™, a plant that was billed as an exceptionally hardy variety that could take heat, humidity and cold temperatures better than many of its cousins. We were skeptical, as we are when a claim sounds too good to be true, but we also took note of the fact that Lavender Phenomenal™ is used in municipal plantings in Europe due to its vigorous nature. We undertook to test the plant’s hardiness. On the crest of a hill at the farm, in a sunny meadow beside our pool, we planted a low hedge of Lavender Phenomenal™ around the perimeter of the pool enclosure. In the first two years, the plants settled in well. They sailed through two seasons of drought. They came through cold winters with nary a plant lost. Deer meandered by, ignoring the plants completely. This season, which brought more rain than we’ve had in years, a moisture level that can be the bane of Lavender, the plants performed equally well, growing, blooming, thriving, their silver foliage creating a lovely contrast with the green grass around and providing a beautiful definition for the fenced perimeter of the pool. The fragrance of the Lavender carries, and the bees feast on the flowers, adding a joyful buzz to the air. Each time we walk across the field and spy our hedge, we have the sudden sense that we’ve arrived in the south of France. How lovely to feel this sensation in our own back yard. 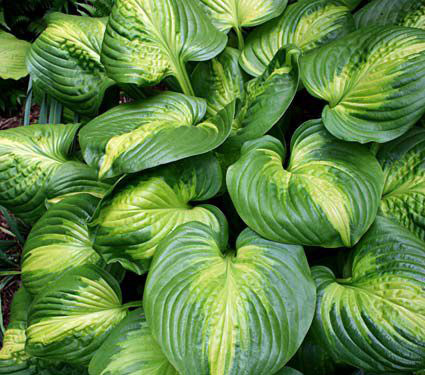 Hosta plants are justifiably celebrated for their robust dispositions and variety of sizes and colors. 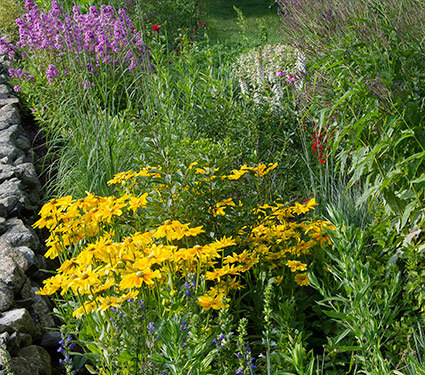 They are an essential, indispensable component for every shade garden. But a few varieties of Hosta have even more to offer. These are the scented kinds that are relatives of Hosta plantaginea. Their blossoms emit a delicate fragrance that is sweet and light, but never cloying. In the dog days of summer, it’s a wonder to sniff at the blooms of these fragrant blooms, which provide such unexpected and pleasing perfume. Bees love the flowers, too, and they sometimes can be found inside the blossoms, so check the blooms for visitors before putting your nose too close. We thought it high time these shade garden treasures were given their due, and next spring, we hope you’ll find room in the garden for our Fragrant Hosta Collection. Next summer, when the blossoms appear, you’ll be so glad you did. In our fall catalog, we were pleased to introduce a new line of magnificent houseplants. These are beautiful specimens, the majority foliage plants, that we carefully selected for their vigor, perpetual good looks, and ease of care. We’re offering them in a range of sizes and styles from tabletop Aloes and Ferns to statuesque Palms and Philodendrons. These plants were an enormous hit at our annual Tent Sale (the table of them was cleared in about the first 15 minutes), and they’re selling briskly via our catalog and website. I mention them again in this writing because our customer service team has been fielding one common question among prospective buyers of these plants. It goes something like this: “Your indoor plants look large in catalog and website photographs, just how big are they?” We’re pleased to report that the scale of the houseplants you see in our photographs roughly matches the size of the plants we send to you (with a bit of give and take allowed for the variations that occur among natural, living plants). Our shipping staff spent a considerable amount of time devising the correct packaging for each new variety – especially the largest – to ensure that our plants arrive at your door looking just the way they did when they left our greenhouses. 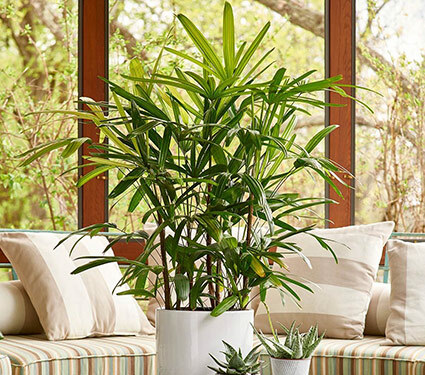 It’s important to note that while all of these houseplants are low-maintenance additions to any home or office, their lighting and watering requirements will differ depending on type. It’s important to familiarize yourself with the needs of your particular plant, the cardinal sin for most being overwatering. 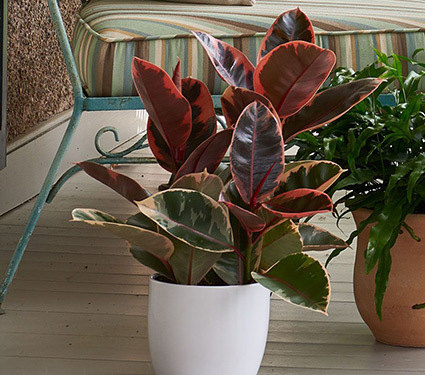 Complete information for caring for each houseplant is included in all shipments. You’ll also find it on our website, on the product page for each plant, under Growing Guide. As we all begin moving our plants indoors for the autumn and winter, we encourage you to add living greenery to your interiors. Plants add color and vitality, and we can’t be alone in thinking they make life better. Yes, add me to your mailing list to be emailed when you have a new blog post. What Is a Hardiness Zone, and Why Is It Important? Jyoti on Do You Know Your Lily Varieties? KITTY STOCKMAN on Do You Know Your Lily Varieties? Robin on Do You Know Your Lily Varieties?